Thunderbird Senior Living is located near 55th Avenue and Thunderbird Road in Glendale and offers independent living, assisted living, and memory care services. 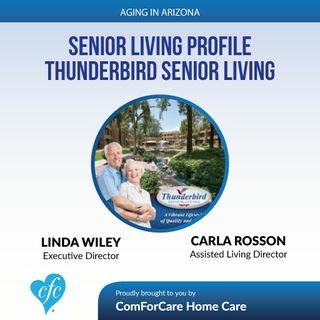 Thunderbird Executive Director, Linda Wiley, and Assisted Living Director, Carla Rosson, joined Aging in AZ to bust some senior living myths, offer some planning tips, and share the benefits that Thunderbird residents experience. For more information, visit www.thunderbirdsenior.com.